The Association of Caribbean States and the United Arab Emirates (UAE) have embarked on an exciting new era of cooperation, with the signing of a Memorandum of Understanding (MoU), which is set to bring cooperation in protection and preservation of the environment, natural resources and the Caribbean Sea, sustainable tourism, disaster risk reduction, among other key areas in the sustainable development of the Greater Caribbean. 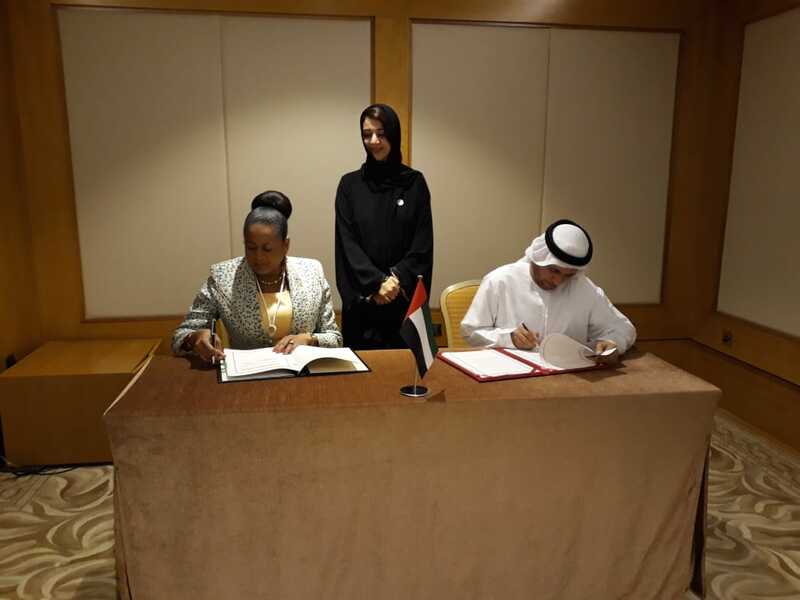 The MOU, signed on 25th November at the UAE-Caribbean Cooperation Forum in Dubai, opens the way for the pursuit of joint cooperation projects between the ACS and the UAE. ACS Secretary General Dr. June Soomer signed the MoU on behalf of the 25 Member States and 10 Associate Members of the ACS. Both Secretary General Dr Soomer and UAE Minister for International Cooperation, Ms. Al Hashimy, shared their excitement at proceeding to the next stage of cooperation and the implementation of joint projects. The UAE became an Observer to the ACS in March 2017 and has since then expressed active interest in supporting the work of the organisation. The MOU provides a framework through which such cooperation will be agreed. The conclusion of this agreement is particularly timely as the ACS prepares to adopt a new triennial Plan of Action for the period 2019-2021. The Plan of Action is expected to be signed by ACS Heads of State and Government at the 8th Summit of the ACS to be held in Managua, Nicaragua in March 2019. Other areas of cooperation agreed upon include: transportation, development of trade and external economic relations, climate change, promotion of the development of small-scale and mid-scale enterprises, cultural development, scientific and technological.